I didn't really know what theme I was going for while taking pictures this morning, but found so many sweet, yet tiny gems that it became the topic.Very often, the smallest of the blossoms are the ones that startle us with their intense color or their amazing structure. Sometimes, they contain strong medicine or powerful scent. No matter what the interest, they carpet the ground outside my back door, and right now they are in their glory! Chives (I deadheaded the whole plant and am being rewarded with a healthy second bloom) dance among the Roman Chamomile and the Thyme. Grosso Lavender reaches for the sun. Deptford Pinks have begun a decent colony right on the other side of the rail fence. They are startlingly bright. I'll have to get a clearer picture of them later. This grove of Elder was imported from Tennessee, and Michele Brown, who shipped it to me from Possum Creek Herbs a few years ago asked how they were doing the other day. LOOK MOM! In front of the Elder, there is an enormous patch of Mountain Mint. It cracks me up to remember the tiny slip I brought home from Sarah Liberta's in Baton Rouge 2 or 3 years ago. Wow. This lady bug is resting on some of the blossoms. Just this year I've realized how closely the Scarlet Pimpernel resembles Chickweed, and how closely they often grow together. On the property here, they are often growing intertwined. Will have to do some research on the Pimpernel!!! NOTE: This plant is edible, and is sometimes called "Poorman's Chickweed". I'm still laughing. How poor do you have to be to have a poorman's version of chickweed? Wild Heart's Ease grows all over the place here. They are so tiny that I barely noticed them at first. Here they grow amidst the Chocolate Mint. Beautiful, dainty, and oh! so fragrant, the valerian is still blooming out front. Again, I took all of the blooms earlier for a tincture, so it is re-blooming. Thyme flowers growing in the shade of a nearby Vitex bush. I can see why the fairies are so fond of these little darlings! Standing next to the Elder and looking up, it looks like lace doilies against the brilliant blue sky. That's it for right now. Soon off to Farm at Coventry. I'm noticing there are 482 posts on this blog... wonder what I should do when I hit 500??? Lavender Shortbread - Gluten Free! There are a couple of lavender workshops coming up tomorrow and the next day for The Essential Herbal, and for the one on Thursday, I really wanted to make some lavender shortbread cookies to munch on while we make some lavender wands. Who knows? Tomorrow maybe lavender lemonade! Ahem... but I'm getting ahead of myself. My friend Sarah is gluten intolerant, so I set about finding a recipe that would work for everyone. It didn't take long, either. A few minutes on the internet brought a simple recipe. Today Molly and I went out for the ingredients - rice flour, cornstarch, 10X sugar and butter. I was excited! Out to the lavender patch to do battle with those bumbly bees. They are having quite a time! I keep hoping that they will flavor some local honey with a touch of lavender. Carefully I trimmed just the purple-est bits of lavender for the most exotic appearance. I followed the recipe to the t, except I will admit to putting the cookies too close together. Even so, they had a sandy, ethereal texture. Melt in your mouth and crumble in your fingers. Very unstable, and I really didn't feel they were shortbread-like. Just because you can't eat gluten doesn't mean you should have to pretend that something is like a thing that it is not. So I thought about it for a while, and realized it needed something to hold it together....egg. I added an egg, and cut down on the butter while adding a wee splash of vanilla. The dry ingredients needed to be bumped up just a smidge to make up for the liquid of the egg. Maybe a medium sized egg wouldn't need that, but I used extra large. That was what they needed! NOW they are shortbread cookies. Blend together the dry ingredients well. Soften the butter, and mix it with the egg and vanilla. Mix everything together and add the flowers. If it is too wet, add rice flour by teaspoons. Make teaspoon sized balls and place on cookie sheet 1 1/2 inches apart. Put into a 300 degree oven for about 20 - 25 minutes until edges are lightly browned. I apologize to those not conducting an herb business of some sort, but there is some pretty big news here at TEH and we need to get the word out. Just skip this entry if it doesn't interest you - and I promise something interesting later. 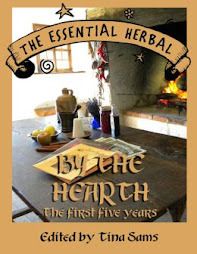 Contrary to the financial uncertainty in the US, herbs and their uses are an ever-growing interest for more and more people who want to play a more active role in growing and preparing meals for their families, learning herbal first aid to use at home, and just enjoying what grows in their midst. 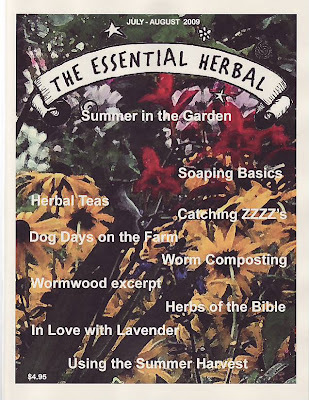 The Essential Herbal magazine is the perfect place to advertise if these are the people you'd like to reach. 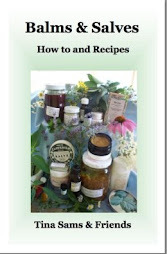 Our pages are filled with the very favorite methods, recipes, and remedies of our readers. They are part of the magazine, making it precisely what it is. With our current issue (Jul/Aug '09) we have gone to a color cover. This enables us to offer a few pages of VERY reasonable color advertising. We will not be cutting the pages up, although we would be very happy to include group ads that are put together by your group. We have 2/3rds of the outside back cover available, as well as the inside back and front covers. Any of these options are available for $400. No bleed, full pages = 7.5 x 10, while the outside back is 7.5w x 6.25h. 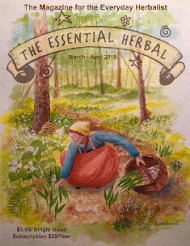 You can check out our demographics here: advertising info, although we will soon need to up the number of copies that are printed for each issue, including the issues we already print extras of for inclusion in herbal and soap symposium goodie bags, etc. And if you are an herb business with zero money left over to advertise, we know that feeling too. In that case, we invite you to submit a recipe, article or craft instruction to the magazine. We'll give you credit and include contact information! Hi - I just voted in the "Love Your Farmers Market" contest sponsored by Care2.com and LocalHarvest.org to help my favorite market, Mount Joy Farmers Market, win a grand prize of $5,000. I care about promoting fresh, local and healthy foods, and I need your help to get enough votes to help Mount Joy Farmers Market win. Please vote here: http://www.care2.com/farmersmarket/10444?refer=19462.09.1245522962.832230. More June Goodness ~ Lavender, etc. Standing at the one end of the row of lavender, you can see that we've got a lot of weaving to do! We may have to take some bunches along to the event we're doing on Saturday if this silly cold rain keeps up! I can't ever remember using the heat in the middle of June before, but it is cold and wet and not even above 60 degrees. Anyhow... enough whining. This is the Grosso lavender. The flowers are more of a pale, grayish purple. The scent is in the camphorous range of lavenders, I'd say. Still, lovely. The Munstead lavender out front is a bit ahead of the Grosso. The color is a deeper purple, and the scent is a tad less medicinal. These have short brittle stems, so they aren't that good for weaving. They are a delight to dry for the buds, though. The first Echinacea flower of the season. I've never noticed that scissored effect at the tips of the petals before, but adore the rusty red center of the flower - even if it will become prickly as time passes. It will lure the beautiful gold finches (distelfinks or thistle finches in Lancaster County) to eat right outside my bedroom windows in the Autumn. With the windows open, I'll hear them sing. The Brown Turkey Fig that I was given last year from the garden at The Rosemary House has returned with vigor! Whew! The funny part is that I kept snipping at the end of the stems that had leaves last year. They seem to still be green/living, but there aren't any leaves. I was becoming fairly certain that it had succumbed to the cold winter. Then, one day I was looking at the hardy Hibiscus that is beside it, and pushed away some of the ground ivy. There were about 4 or 5 fig leaves! It was one of those "gee, I hope the neighbors didn't notice me squealing and jumping around" moments. Yesterday I saw that one of the Pawpaws has a single leaf. I may have killed the other one. It seemed dead and I pulled it out, only to realize that the stem was pliant and alive. It was quickly tucked back into the hole, but we'll have to see what happens. Why do these plants torture me so? It is mid-June, for crying out loud! Saint John's Wort. What can I say? This beauty eluded me for years, finally getting large and robust last year, only to die from something horrendous that began as black stems in the center, and expanded. So, somewhere along the way, I've planted SJW in the front garden and in several locations out back. It has decided it wants to be in all of those places. We have lots this year. This picture is actually to show off my new banner. Vistaprint.com was running a special, and the banner came for the price of (very expensive) shipping. It's pretty cool, and really easy to tape up to a wall. Our other banners are heavy weight, lovely, but too heavy for this kind of action. Oh and check out all my trophies! LOL. Ok. I lied. We were set up at a high school and THEY had a lot of trophies. Pfft... We did a talk on edible backyard weeds, and took along an edible bouquet, passing out sections of it as we talked about the different plants and flowers. No matter how many times I see fields of wild daylilies, I never get tired of their beauty. That's all for now, folks. I'm off to make some chili and cornbread to warm us up in this icky weather. I was researching some recipes for the little newsletter we do for our local farmers market and came across the following on the King Arthur Flour website. I changed a wee bit of wording, but the ingredients are intact. It looks so good I can't wait to try it! Lately we've been doing a lot with wild edible plants. The chickweed/scape recipe from out last post and the talk it was for... If you're looking for a great wild plant cookbook, we've got it! Wild Foods for Every Table was put together here at The Essential Herbal and has the favorite recipes from readers all over the country. Cream of Spring Onion SoupAlthough we’re using onions, mushrooms, and spinach, don’t be bound by the parameters of this particular recipe; use it as a base for whatever fresh vegetables you have on hand, can gather in the woods, or can find at the farmers market! Melt the butter in a large saucepan, and sauté the spring onions and mushrooms until the onions are transparent and the liquid from the mushrooms has mostly evaporated.Stir in the flour, and cook gently for several minutes. Stir in the chicken broth or water a little at a time. If you keep stirring, it won’t become lumpy. Add the milk and bring to a boil. The liquid will thicken just a bit. Add salt and pepper to taste, the chopped fresh spinach and cream or evaporated milk if desired. Bring soup to a simmer and serve immediately so it retains its bright green color. I'm not sure where, but lately there have been mentions of garlic scapes in the periphery, and it has snagged my attention. They have shown up at market, and because my sister and I do a 2-page newsletter for the market every other week, that meant looking into recipes for scapes. As it turns out, we have a wild foods talk and demonstration on Monday, and the plan is to pre-make most of the chickweed pesto, and then demonstrate how to make a smaller amount. Today was the day. Steve and Mary Prescott from Prescott's Patch had a mess of scapes today, and we did a swap at the end of the day. The chickweed pesto is finished, and it is so delicious that I will make more tomorrow to freeze. I am officially in love with garlic scapes. I gathered a huge basket of chickweed and a few leaves of basil and thyme. First, I processed 6 scapes, about 1/4 cup of walnuts, and 1/4 cup of Parmesan cheese with enough olive oil to work easily. When that was fairly smooth, I added about a cup or so of chickweed, adding a second cup when that was incorporated. It was much easier to chop the chickweed and the scapes into manageable pieces before putting them into the processor. After it was well blended, I added a little more oil and processed until it looked like the picture at the top. 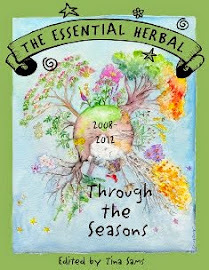 Is it a new day at The Essential Herbal? It just might be! A clear-cut case of lemonade from lemons has brought about a new printer and a bunch of new printing options. One of the most visible? Color! We aren't certain whether it will be color for every issue yet, but at least some of the time it will be. Hop over to the website and subscribe if you haven't already. This magazine is awesome! We can also offer some limited (and very reasonable) color advertising options for the back and inside front and back covers. Our most recent outing was this past Saturday - to the Alloway Creek Garden Faire. Barb and Roger Steele have thrown this great party for as many years as we've been doing herb festivals, and it's always been a good time. This year we had to bail on the Friday portion, as it was raining buckets. Below you'll see our full array of goods - jewelry, bath and body, balms, tinctures, teas, soaps, salt spa bars, sniffing jars, soap stones, books, incense, essential oils - we take some of everything. Maryanne is a much photographed person lately! She also hit the front page of the Columbia Register this week at our farmers market. I was in the picture too, but it was only unrecognizable parts of me. Sharon Magee's Herbal Pottery was there. Sharon is not on-line with her stuff, so let me just show you how spectacular her work is! You can request a pricelist at herbalpottery@msn.com - just mention that I sent you :-). I believe she has a brochure she can send out. One of my favorite flowers is delphinium. Unfortunately, it seems to be a favorite of the long-toothed rodents around here too. I have one out front that continues to attempt to grow, but is nibbled down the minute it appears to be winning. So... I will just have to be content taking a picture here and there of other people's delphs. I loved the way this opportunistic jewelweed sprang up between the display shelves. Look how lush it is! The last few weeks of rain meant that the gardens had a lot of volunteer surprises in them. Barb and Roger are just mellow enough to realize that it wasn't worth the aggravation, and there were some beautiful scenes. This is the area that all gardeners have, but we don't usually see... it is where we toss the clippings. Back behind this building there was a delightful motherwort colony, some celandine, a poke, some catnip, beebalm... it was pretty interesting! Along the roadside, mullein gets to look pretty bedraggled. This specimen growing in the shade was simply beautiful. We had a good time at the faire, and now it's time to start another week. The next issue should be delivered shortly, and it will be in the mail in a few days. Order between now and the 15th, and we'll throw in a 7th issue for the price of 6! how about some lavender syrup? Isn't this an interesting color? I had a request for some lavender syrup. It is made much like any of the others we've talked about here on the blog in the past. The herb is steeped for a period of time in hot water, strained, lemon juice added, and it is made into a simple syrup. Lavender doesn't really impart much color, though. I pondered and pondered, not really wanting to add anything artificial to the blend. Finally my eyes lit upon a handful of blueberries left from a pint I'd gotten at market. Adding about ONE berry for every 2 ounces of liquid, this is the smashing color that came of it. The lemon juice probably helped a lot. Oh - it tastes wonderful too! People often ask me what you can use these syrups for. Some use them to make exotic cocktails. I don't drink much alcohol, so there are many other ways we use them here. They can be used as a sweetener any place that a little bit of an herb-y or floral flavor would be good. See? They are good everywhere! 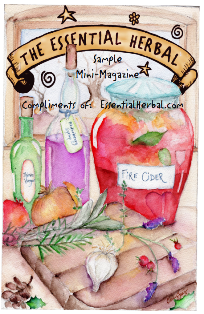 This article was co-written by Tina Sams and Maryanne Schwartz and ran in the Jul/Aug '08 issue of The Essential Herbal Magazine, where there were several pictures and recipes accompanying these instructions. One of the most basic ways to use herbs medicinally is in a salve or balm. These preparations are carriers of the herbal properties and enable the user to apply those properties to their skin in an appropriate formulation. We consider a salve to be softer (like Vicks), while a balm is stiffer, like a lip balm, and holds its shape if removed from a container. Many times the terms are used interchangeably. Both salves and balms are made by combining oil and wax. The amount of wax used determines the hardness of the final product. Less wax equals a softer product, more equals a harder product. Many different oils can be used. Olive oil is the most common. Jojoba oil might be chosen for its long shelf life. The list goes on and on, with choices like butters (shea, mango, cocoa, etc. ), solid oils (coconut, palm, soy), and liquid oils (sweet almond, apricot kernel, avocado, etc. ), and various blends. Rendered animal fats like emu oil and bear grease are considered to be very healing all by themselves. Keep in mind that anything made from wild animals may not be sold in any way, shape, or form. Herbs and their healing properties are added to the salves by infusing the oil(s) prior to blending with wax. There are a lot of different ways to infuse oils. Many people have specific ways that work very well for them, and like old family recipes for that special dish, they are all considered to be the best. Considering that plants come to us with different strengths and potencies based on growing conditions, etc., infusing is something we don’t stress over much, worrying mostly about avoiding things like mold. Infusing fresh herbs can be tricky because fresh herbs contain water. Water in oil can provide a medium for bacteria to grow. Because of that (and because we are time-impaired herbies), we prefer to wilt the herbs well to evaporate some of the moisture and then use low, gentle heat to infuse, the heat removing the rest of the moisture. Some infuse herbs for weeks, months, and even years, but using gentle heat can provide good infusions overnight. We usually make our salves when the plant is growing and make what we expect to use that year until the next growing season. Additionally, essential oils can be added to salves/balms with great results. Once the oil(s) has been chosen , infused, and well strained, it is time to warm it with beeswax and create the salve. For a firm balm, use 1 part wax to 4 parts oil. For a looser slave, cut the wax to 1:6 up to 1:8. If using solids like butters, very little wax is required. Heat only until wax is melted and blend well to avoid separation. Add any essential oils just before pouring into wide-mouthed jars or tins, blending well prior to pouring. Prepared in this way, your salves and balms should hold up through the year with no need for refrigeration.